The Big Takeaway From LocalUp: Get Mobile, Get it Right, or Get Out of Town! Zach and I recently attended LocalUp Advanced at Moz’s headquarters in Seattle—a conference that delivered current information on how to succeed in today’s world of local marketing. There was one theme that we wanted you to know about, one theme that came up again and again: mobile. From discussing the factors that will most affect Google’s mobile ranking algorithm to updates in the way Google displays local results on mobile devices, the significance of mobile communications to your business’s web marketing efforts could not be ignored. A “pack” in Google’s mobile search results consists of the top three local listings that appear on the results page. Called the “3-pack,” these results are tailored specifically to mobile devices, in recognition that few people will take the time to scroll down past the top three results. Also, to view additional local listings, the searcher must scroll horizontally, which is not very intuitive at first glance. So if you want to be successful in local mobile search, your listing needs to be included in the 3-pack. This is big stuff! If your site doesn’t have a “mobile-friendly” tag when it appears in mobile search results, get ready for a potential drop in visibility and traffic. 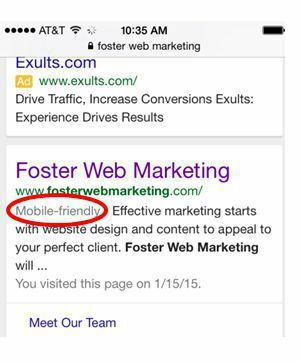 Google has expanded the use of mobile-friendliness as a ranking signal for organic mobile search results. To see if your website is mobile-friendly, simply search for it using a mobile device and look for the tag. It’ll appear just under the title in your listing. Another way to check the mobile-friendliness of your site is to run it through Google’s Mobile-Friendly test, found in the Google Webmaster Tools. It’s not enough to have a mobile site; your site has to be user friendly. Not only is usability a big part of Google’s mobile ranking algorithm, but nobody has the patience for a mobile site that’s difficult to use. The best way to determine ease of use is to run it through the Google Page Speed Insights Tool. This handy tool (we use it all the time and love it) will give you two scores: one for your mobile site load time and one for user experience. How Does Your Mobile Website Stack Up? I urge you to take a closer look at your mobile website and run the tests suggested here. Is your business listing in the local 3-pack? Has it been given the seal of approval with a “mobile-friendly” tag? Did it score well? If not, you’ve got some work to do. Speak with your webmaster or request a site analysis. We will go over your report with you personally, and let you know exactly what needs to be done to improve the performance of both your mobile and desktop sites. Establish content topics that are relevant to your business and your prospective clients’ needs. When writing a thorough piece of content that covers a topic, you’re going to naturally include terminology that will improve your website’s visibility for that topic. Research these topics and make sure you’re covering the big ideas each time you write content for your website. Get more reviews to stick. The experts at LocalUp asserted that the best places to get reviews for your business are Google+, Facebook, and Yelp. These sites represent the most-used review sites. But getting these reviews isn’t easy, and there are certainly some tricks and tips to help you prevent your reviews from being filtered out. For Yelp, one of the best ideas is to filter your email list in Yelp. This will give you a list of every person on your list who has used Yelp. Another way to get similar results is to use a Facebook graph search for people who “like” your business and use Yelp. With this list in hand, go ahead and tactfully ask for reviews on Yelp, using the tips we outline in our detailed article on asking for and getting reviews for your law firm, medical practice, or other business. Another recommendation addressed the use of mobile for reviews. When asking for a review on Google+ via mobile, go into Google+ and search for your business from a mobile device. The mobile review on Google+ does not work with the desktop URL, so you’ll need the mobile-specific URL to be successful. And as always, it pays to know your audience. Younger users will accept reviews that are lower than older users, who are looking for a score of at least 4.5. So if you have an older audience, know that they will not settle for less—and make 4.5 your goal. Use caution with your virtual offices. Are You Ready to Take Control of Your Local Search Presence? I’ve given you all the information you need to make this the year you overtake your competitors in local search. My questions to you is: What will you do first? Let me know by commenting below. Also, feel free to share the other ways you’ve beat out the other guy and improved your search presence! Tyson, it is almost impossible to get a perfect score. There are some necessary site elements that prevent you from getting a perfect speed score including Google's own site search function. Comparatively your site scores very high in both site speed and user experience. However, we are taking look at your mobile site to see how we can get your site speed score even closer to 100/100. Awesome article, and I was very pleased to see that my website is mobile-friendly, when I used the Mobile-Friendly Test. I also did the Speed Test, and it showed I need to make a few changes, as my score could be better.